I wish it snowed where I live. We don't have enough humidity. Hehe, I'll get to see snow as soon as I hit Ohio.Always love the way you draw hair.It's almost as if you can feel it.Cute :). I love that hair. And the eyes are adorable. =^~.~^= Awesome picture. I love it, the combination of realism and cartoon. Fantastic work as always. I love the snow and miss it something fierce down here in Florida. The snowflakes in this picture have a good sense of dimensionality to them and add to the sense of depth. Whoa...this could be on the back of Reader's Digest! THIS IS SO CUTE!! Aww, it's so Christmas. I love it. The hair is so shiny and her scarf looks like it's velvet green. Pretty awesome job, Priszcilla! I wish It snowed In Louisiana. I wish I knew what snow was, I never realy seen It before. The style you used is awesome, and the hair Is very well done. You have such a wonderful style. The pictures are always cute, but they are also interesting and well drawn. 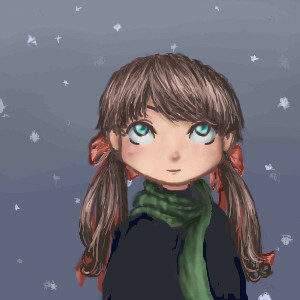 I wish it snowed in Brazil o_O (only in south... And i´m in the middle... Boo-hoo) Pretty hair... Her expression is so cute! I find it so interesting how you combined naturalism and the cartoonish style together...This little girl just makes me smile. Adorable. :3 I love the hair! haha I l ove the hair too-how cute! Awww Shes really cute. Nice job! I've always loved this drawing. Every year I put this as my desktop wallpaper. Heyyyy...didn't I see you on Gaiaonline?